Bangladesh Krishi Bank Job Circular 2019 has been published. Bangladesh Krishi Bank is now published job circular Related Notice . A attractive job circular published the Bangladesh Krishi Bank. Joining the smart,willing and big govt. banking team of Bangladesh Krishi Bank. Bangladesh Krishi Bank is the most important department and dependable Banking service team in Bangladesh. Bangladesh Krishi Bank is now working in all location for helping the people of Bangladesh. Bangladesh Krishi Bank Job Circular 2018 related all the information are given below. Bangladesh Krishi Bank is a large government bank in Bangladesh.It’s have many contribution on agricultural sector on Bangladesh. It has a large number of branches in rural area including urban area. They have published a attractive jobs offer on the circular. WE have collected the circular from their official website www.krishibank.org.bd. 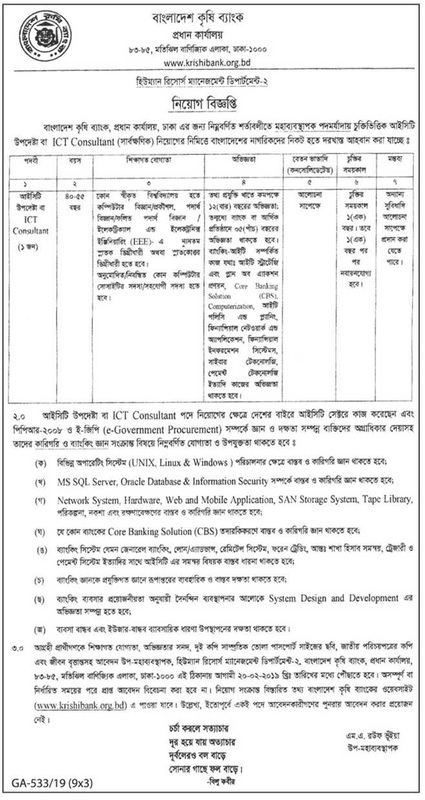 Here are we attached the jobs circular to check if you have any desired position. Krishi Bank Officer Job Circular 2018 will be found on my website. Bangladesh Krishi Bank (BKB) human Resources Division publish total eight category job circular. These job positions are as Senior Officer (General) and Officer (General). Bangladesh Krishi Bank (BKB) published a new Job Circular 2018 for the post of Senior Officer and Officer (General).